For Ferry Plaza Farmers Market goers, the name Saint Benoît is synonymous with French-style organic yogurt and award-winning yogurt cheese in old-fashioned, reusable clay crocks. This Saturday, Saint Benoît becomes the market’s only milk seller, at a time when organic milk producers struggle to meet the high demand. Nearly a decade ago, Benoît and his brother moved to the States with the idea of starting their own sustainable food business, having been inspired by cheeses from northern California. Their idea was to apply French artisanal methods and the concept of terroir—a term used to describe the special characteristics that climate, geography, and soil impart to wine and other products—to yogurt. In 2003, they teamed up with fourth-generation dairy farmer John Mattos of Diamond M Dairy in Two Rock, near Petaluma. The de Korsak brothers found Mattos’ organic all-Jersey milk to be perfect for producing creamy, artisanal yogurt. 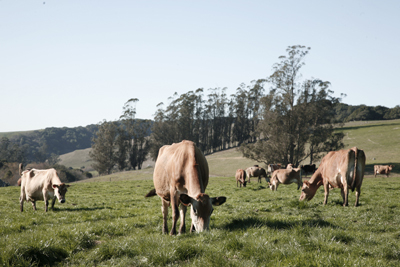 Jersey cattle, a smaller and more agile breed than the standard Holsteins, are especially well suited to the hills and steep slopes of Sonoma County. And they’re efficient grazers to boot: a Jersey cow typically eats about half of what a Holstein eats, but she produces only about 30 percent less milk. “They’re a good option if you want to run a sustainable operation because they require less acreage than other cows,” says Benoît. “That enables the farmer to buy and truck less feed, which means a smaller carbon footprint.” At Diamond M, the cows mostly feed on grass and other forage, and less than a quarter of their diet comes from organic grains. When the cows are being milked, Mattos supplements their diet with organic hay grown in Shasta County. The de Korsaks launched Saint Benoît Yogurt at the Ferry Plaza Farmers Market in 2004, and began sourcing ingredients from market sellers like Lagier Ranches, Marshall’s Farm Natural Honey, and Twin Girls Farm. “Saint Benoît grew out of being a part of the community and sourcing our ingredients from those farmers,” he says. Three years ago, Benoît converted an old milking parlor on the Diamond M property into a creamery, where he could process the milk into yogurt. The creamery now uses about 10 percent of the Mattos’ herd of 500 Jerseys for their dairy products. From the farm, it’s just a mile to Saint Benoît Creamery, where the milk is freshly processed each morning in 200-gallon batches before it’s brought to market. 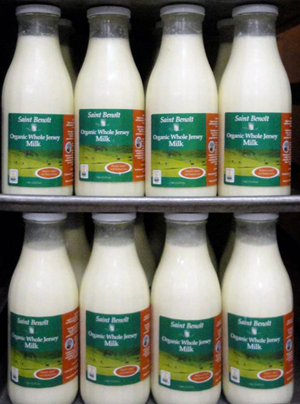 In order to preserve the cream top and the naturally high butterfat of Jersey milk, Saint Benoit milk is not homogenized. The fat content hovers around 4 to 5 percent, depending on the season and the cows’ diet. Cows drink more water in the summer, so the flavor of the milk is richer and more concentrated in the winter months. 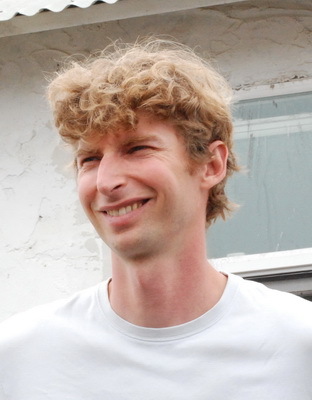 Benoit believes that these seasonal fluctuations contribute to the milk’s unique flavor and terroir. The creamery uses vat-pasteurization, also known as low-temperature/long-time treatment, in which the milk is heated to 145°F for 30 minutes, the lowest standard the FDA legally allows. “By pasteurizing at a lower temperature, you get the health benefits of raw milk without the potential harmful bacteria,” Benoît notes. Vat-pasteurization translates to a shorter shelf life—14 days—than the more conventional high-temperature/short-time pasteurization (161°F for 15 seconds) and ultrahigh temperature pasteurization (280°F for 2 seconds), which extend the shelf life up to three weeks or three months, respectively. These higher temperature methods allow for longer storage times but compromise flavor. While many large organic milk operations combine many small dairies’ milk in a single facility and then distribute it around the country, Benoît takes pride in being able to provide fresh, local milk from a single source. With hand touches like selling the milk in French-made reusable glass bottles, the creamery’s approach is to stay regionally rooted, small-scale, and sustainable. View a slideshow of CUESA’s farm tour of Diamond M Dairy and Saint Benoît Creamery here. Saint Benoît Creamery can be found at the Ferry Plaza Farmers Market every Saturday in the back plaza, in the vendor aisle. The milk is $4 for a one-liter bottle, plus $1.50 for a returnable bottle deposit. Photos of Diamond M Dairy and Saint Benoît milk courtesy of Saint Benoît Creamery.